The SUGAR Group is excited to add two new staff positions to our team of volunteers and even more excited about those who have accepted our invitation to fill those positions. Jennifer Kloepfer (Jen102375) joins us as our COMMUNITY LIAISON. Jennifer's primary job is to initiate 1:1 contact with community members in an effort to increase participation in our survey research. Don't be surprised if you hear from Jen in the future! Jennifer is a resident of WI, where she lives with her husband and 3 girls. Jen tells us "My Passion in life other than my family is animals and medical research. That is why the Sugar Group means so much to me and why I am really excited to be joining such an important group close to my heart." Chris Reams (Texas T) joins us as our EVENT COORDINATOR. Chris' primary job will be coordination and organization of our annual RRRoundup and other special events. Chris is a resident of Amarillo, TX. and mom to 4 beautiful, neutered male sugar gliders. 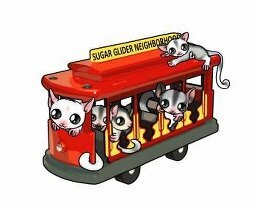 Though new to sugar glider ownership, Chris is no stranger to organizing large events, and we know she will be a fantastic addition to our team. Chris tells us "After spending time with Val and seeing all the good things she and The Sugar Group do for the good of the glider, I decided it was time to start doing my part to help where ever I can. The Sugar Group is such a good and respectable organization, that I want to be a part of it. So here I am! And I am very excited!" Both Jennifer and Chris have already jumped right in and begun to fulfill their duties. Both hold voting positions with the SUGAR Group. We are thrilled to welcome Jennifer and Chris to the team and looking forward to many years serving together.